As a child, you wanted to quickly grow into an adult so that you could make your own decisions and live life your own way. As an adult, you miss those carefree times when everything was well taken care of. You never realized there are so many things you need to look after once you are on your own. One of the most crucial but often neglected areas is personal finance. It can be a little overwhelming to manage your personal finances if you do not have a finance background. 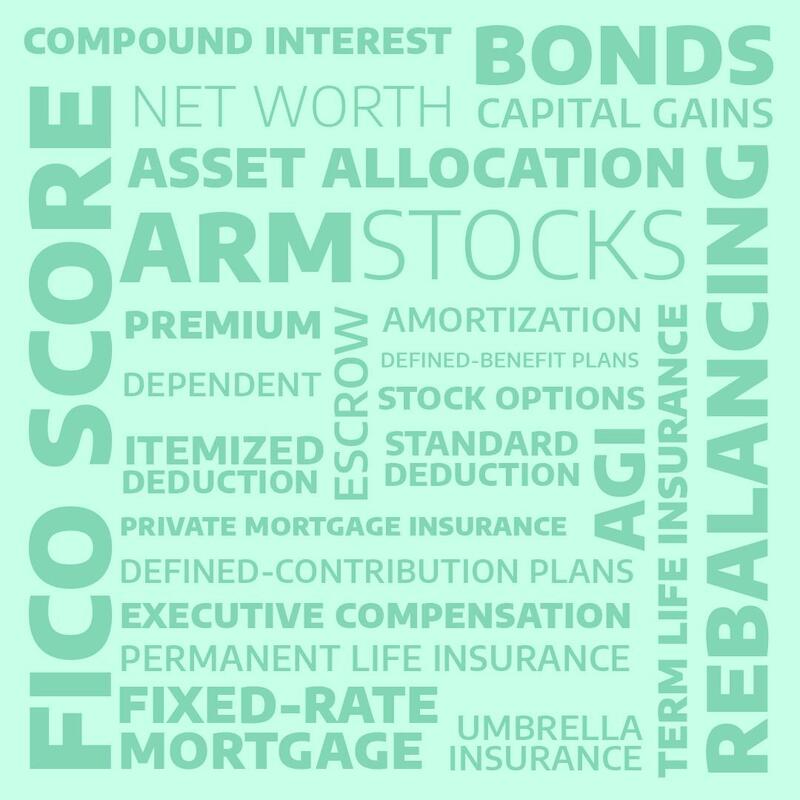 To make your life a little easier, we have simplified some common financial terms for you. Read along to know more about them. This the total interest that you earn on your savings and the interest on the initial deposit. In other words, it is interest on interest. In case of loans, it is the interest that you have to pay on the principal and the interest that gets accumulated on it. Due to compound interest, your savings and debt grow faster with time. It is something that has an economic value. It could be something you own, use or generate income from. It could be a physical asset such as cash, jewelry, real estate or a non-physical one such as a patent. Your financial liabilities are what you owe to someone else. It could be a friend or a financial institution. Loans from banks or friends are classic examples of liabilities. It is an obligation on your part to repay your liabilities either in cash or services. It is the difference between your assets and liabilities. To calculate your net worth, add up everything you own. Also, include the current market value of your home and car. Subtract your current liabilities from this amount. Your net worth figure is a reflection on your financial well-being. You all must have heard about how investing your money helps you to create wealth. Asset allocation is the strategy to distribute your money across different asset classes. You can choose from stocks, bonds, fixed deposits or mutual funds. Your asset allocations must depend upon your personal goals and risk tolerance. A business’ cash flow is the total funds that move around within a period of time. It includes incomes and expenses. The cash flow determines the financial health of a business. It indicates the total assets of the business in excess of liabilities. The bottom line of a company is its total income. It is the last figure that comes in the ledger. The bottom line is calculated by deducting the company’s expenses from its income. It is an ownership in a company. You become a shareholder when you buy a stock of a company. The stock prices go up and down depending upon the performance of the company. An abbreviation for Sensitivity Index. It is an indicator of the movement of the Bombay Stock Exchange (BSE). It comprises of the top 30 companies listed on the BSE. Sensex’s up and down movement is an indicator of the general market sentiment. These terms are used to describe the stock market conditions. A bearish market is when the stock prices are going down and investors are pulling out. A bullish market is when the stock prices are moving upwards. The investors pump in more money into the market in a bullish market. It is like a report card where you are marked on your past credit behavior. Your credit requests like credit cards and loans appear on this report. Any delay in replaying your loan is recorded and may impact your future credit applications. It is a numerical score that indicates the credit-worthiness of an individual. Lenders prefer considering the credit score before extending loans and credit cards. It gives the probability of a person’s capability to return the advances. Mutual funds invest the money collected from investors to different asset classes like stocks, bonds, etc. It is a useful tool to benefit from the stock market if you do not have the time to update yourself on a daily basis. You must have often heard of companies rewarding their employees with stock options. It is basically a share in the company that is on offer. The employee can choose to buy their employer’s shares at a fixed price and profit from selling it in future. It is a tax relief proposed by the government that reduces your taxable income. There are various investments that you can make to enjoy this exemption under different sections like 80C, 80CCC etc. The PF Act mandates that an organization has to contribute 12% of its employee’s basic salary to his provident fund. An equal amount has to be contributed by the employee. On retirement, the employee gets a lump sum amount including the interest. It is a contract between an individual and an insurance company. It covers the death of the individual and provides a lump sum amount to the beneficiaries. The individual has to make premium payments in exchange. This life insurance is valid only for a certain period of time. The insurance company is liable to pay insurance cover if the individual passes away during this time. Expressed as a percentage, it is the total increase or decrease in the prices of goods and services. If it increases, you can buy lesser things with the same amount of money. It is an indirect tax that has replaced all the previous indirect taxes in our country. It is levied on both good and services and is levied at every point of sale. It is the government’s initiatives and actions that influence a country’s economy. It includes strategies to generate income as well as expenditures for public welfare. It is formed by the central bank and is directed at stabilizing the economy. In India, RBI defines the monetary policy which in turn impacts the interest rates at banks. Short for Gross Domestic Product, it indicates a country’s total economic activity. It a numerical figure that represents all the goods and services produced in a country. It is calculated annually or quarterly. It is the most basic type of account that you can open at a bank. You can deposit money into this account and earn interest on your savings. Most banks offer added features like credit cards, chequebook and net banking with a savings account. This account facilitates a high number of transactions to a business. It allows any number of deposits and withdrawals in a month. There is no interest earned on this account.